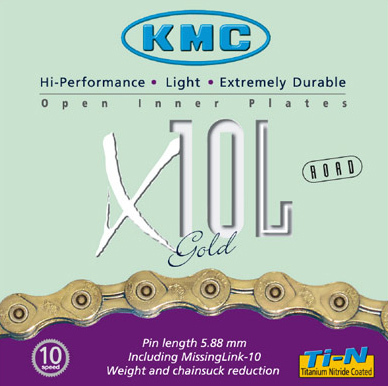 Essentially the same chain as the X10 .93 but with lightened inner plates and Titanium-Nitride coating for reduced running friction and extra hard surface, which means even longer life! This chain supersedes the X10 Gold. 112 links including "missing link" connector. 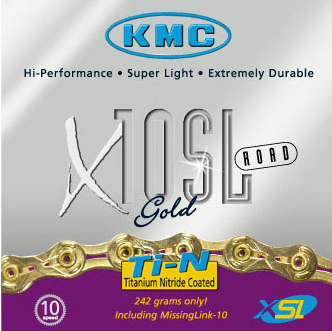 Essentially the same chain as the X10 SL but with Titanium-Nitride coating for reduced running friction and extra hard surface, which means even longer life! Inner plates lightened. 112 links including "missing link" connector. 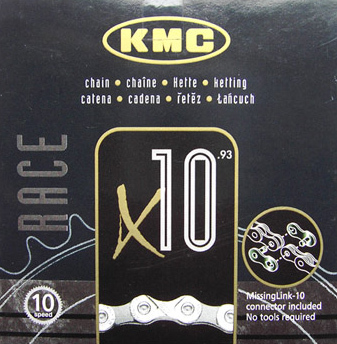 10 speed chain (Campag and DuraAce compatible) with X-Bridge for superior shifting and X-SP extra stretch proofing treatment for long life. Bulls Eye super strong pins. 112 links including "missing link" connector.